Welcome to Maple-Oak Farm, breeder of purebred Saanen dairy goats. 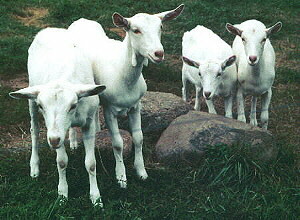 The Saanen breed is known for its size, high average productivity, easy-going temperament, and shiny white appearance. We pay close attention to these traits in our Saanens while striving to breed for functional type. Our objective is to contribute to the Saanen breed, animals that are both competitive in the show ring and are structurally sound in order to lead long productive lives as dairy animals. This web site is designed and maintained by Maple-Oak Farm. Copyright (C) 1997 - 2019 Maple Oak Farm - Angelwood Soap Company, LLC - All Rights Reserved.